some mushrooms pushing upwardly and outwardly so they can reach maturity and set their seeds known as spores. This once again shows how reproduction and patterns are so often linked just as the fallopian tubes inside a woman take this form as well. There is indeed a plenty of places where you can see this pattern and often it is glimpsed in space and time in water. When you paddle in a boat this form comes from dipping the paddle in the water and pulling backward and spirals resulting off of both sides of the paddle. When eating miso soup, which gives a nice substrate through the fermented soy for observation, if you gently dip your spoon into the bowl at a more horizontal plane, this pattern is easily seen. As well when doing dishes with a full bucket of water or full sink, one can easily recognize this pattern when placing the plate inside the water. 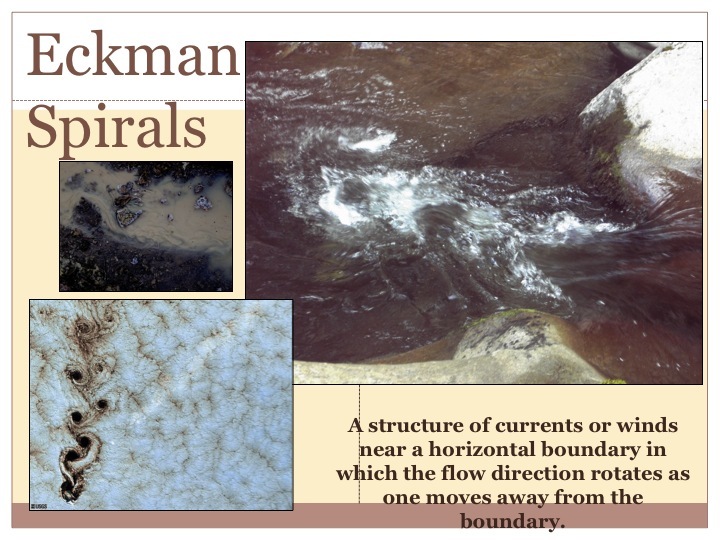 Ironically enough, beyond water, I also found the pattern in this erosion of wind and water in a rocky cliff on the Pacific Coast of California seen above. It is subtle but these shaping forces had some how been wielded to reveal this elegant pattern. It made for a great viewing and sitting spot comforted by the edges and large central platform. It is also seen in fruits like the ones seen above of the subtropicals known as Tamarillo on the left and Feijoa on the right. The Tamarillo shows the explosion of life, ironically very similar to explosion of an atomic bomb, within its fruity base. It packs seeds in efficiently to have its seeds spread far and wide by all sorts of mammals, including us humans. The picture on the bottom shows fetal development and the springing forth of life. 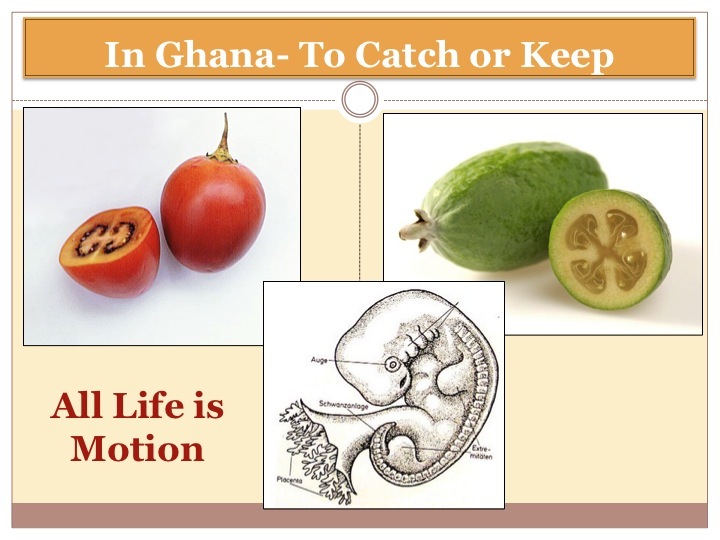 As they refer to this pattern in Ghana is to catch or to keep, the fetus is catching many evolutionary steps and abundant energy from the mother to spring forth in its growth. It is held tightly in a safe form and when the next stages of development are ready, a sort of succession or evolution of form is ripe for development. It unfurls through this dynamic explosion of life thus spreading the mixing of genes from mother and father, left and right, into one being. Meanwhile in design on the right you can see an ornamental garden that helped to inspire me to use this pattern on the left. Both are in New Zealand where I worked 2006-2007 and was early on in my Permaculture journey where Pattern exploration was vital. The one on the left was a garden I installed with my then time partner and the Maori fellow we were staying with. We had an amazing cultural experience of sea-side living and rhythms of collecting the seafood when the winds were right. In between we were working very hard at creating a garden at his small block at the very southern edge of the South Island in a fairly rough coastal climate. Thus we used Ponga Tree Fern posts that he has bought for something else and created garden bed edges. He was quite adamant that he didn’t want straight rows because it reminded him of the European complex that helped to perpetuate the colonial raids of the country thus diminishing the traditional lifestyle of the Maori people. 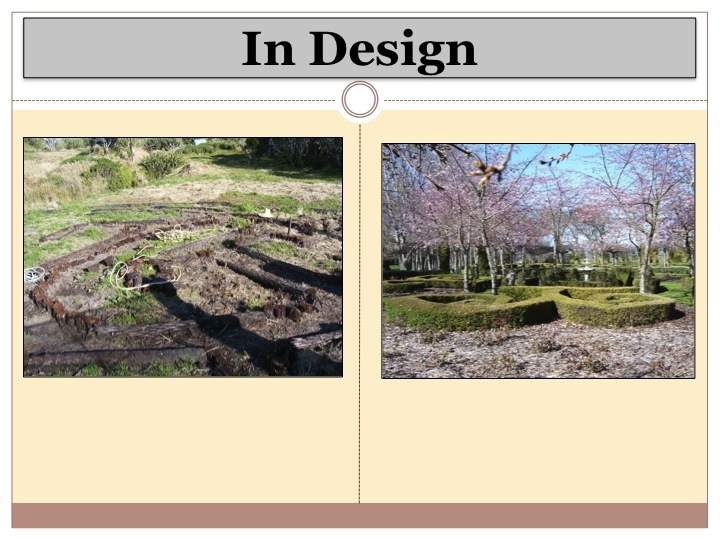 So we looked for pattern inspiration and application to create an efficient but non linear shaped garden. We laid the garden out with ropes, being seaside, we had a lot of them. 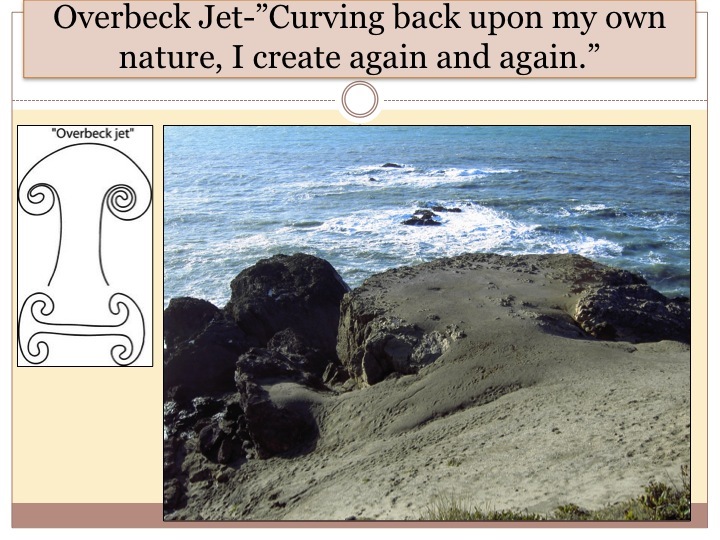 We created this overbeck jet to symbolize the renewal of life and the springing fourth of abundance. He was quite pleased with this pattern, the dendrites resembling leaves, and other wonky shapes we were able to bring into this design. The next two patterns are again increasingly complex and compliment each other. They are both spirals or overbeck jets diffusing energy as obstructions in flow cause this effect. These patterns teach us about why windbreaks are shaped the way they are and give an inspirational rise to bed layout. 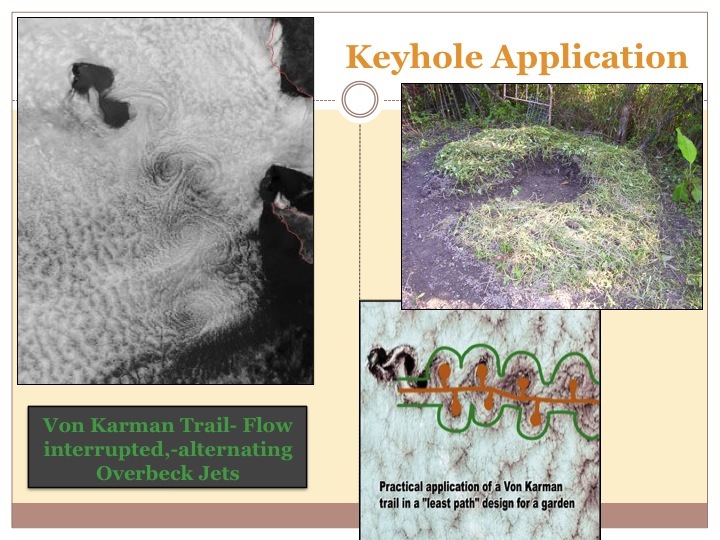 We can use dendirtes, as a leaf does to transform energy, but we can also use the Eckman spiral, as seen below on the right, to create edge enhancing keyhole bed application. In some ways, its like the lobes of our lungs, functioning through dendrites for oxygen exchange, but containing its structure in a more complex pattern of spirals upon themselves. Keyholes allow for a minimizing of path space while increasing edge and also decreasing path space. I feel they are a great application for a zone 1 garden where this is quite important and management is done much more by hand allowing for the this curvy form to take root. They are aesthetically pleasing and break from the rectilinear form providing an easy immersion into the subtle qualities of patterns that are the basis of Permacultures vantage point of the natural world.